The Return on Investment metric is used to evaluate the efficiency of an investment. In one sense, it’s a productivity measure. Outputs divided by inputs. We discussed the ROI metric in a broad company-wide sense, rather than the ROI of a single equipment purchase, which it also can be used for. What is great about ROI is that it can give you a broad view of your company. Also, it has terrific drill down capabilities to help you find the root cause of any negative or positive trends. ROI can also be used to help evaluate management. It can give business owners an overall picture of department heads and their effectiveness. Due to the drill down nature of the metric, you can isolate problems to specific departments, if you see negative trends in your ROI. The main limitation with ROI is that it has no predictive capabilities. It is only useful to analyze historical events and trends. ROI is simply Net Income divided by Total Equity. This will give you a percent. In the example below, I can see that my ROI is 50% or for every dollar of investment, I will make $0.50. Think of it as putting $200 in the bank and getting $100 of interest—OK, not very realistic, but you get the idea. To drill down into the components of ROI, you will need data from your balance sheet and your income statement. So make sure you have those two ready. Linked below is an excel spreadsheet that will help you with the calculations. It has three tabs. The first tab lists the financial values you need. 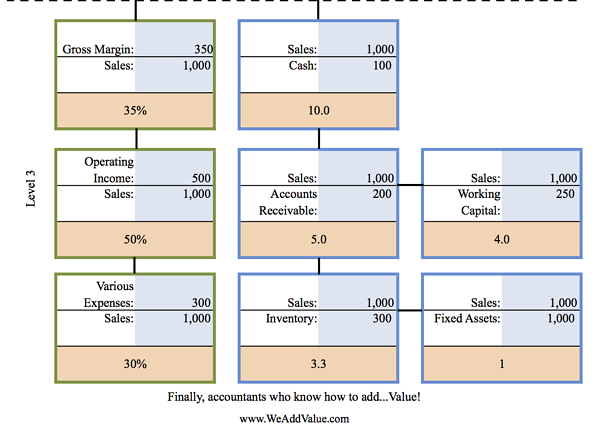 Place the financial values into the corresponding cells and the spreadsheet will calculate your ROI, Return on Assets (ROA), and an Altman Z Score. On the ROI tab, we have the ROI and some of its components broken down. Starting at Level 1 you have the basic ROI Calculation. 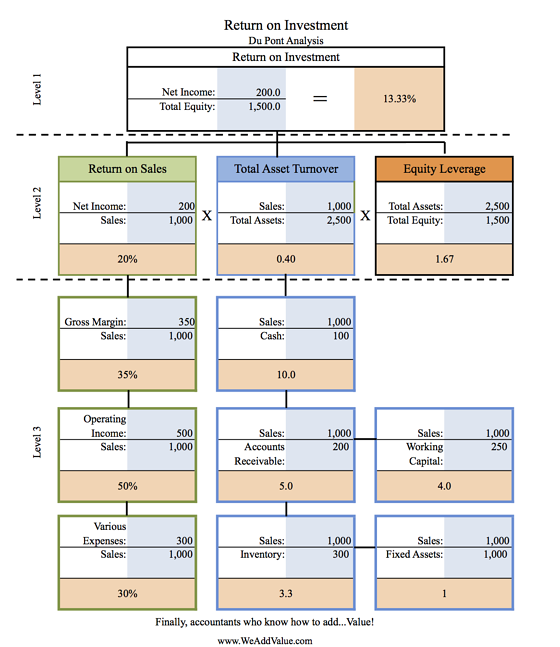 In Level 2 you have the first three components of ROI – Return on Sales, Total Asset Turnover, and Equity Leverage You can see that ROI is also calculated by multiplying these three metrics together. In Level 3, you have the breakdown of level 2 metrics. One item to note in your calculations, the metrics under Return on Sales (1st column in the green border) are calculated with values from your income statement. The metrics under Total Asset Turnover (2nd & 3rd column in the blue border) are calculated with values from your balance sheet. For a more accurate metric, the values from your balance sheet should be averaged with the previous balance sheet statement value. For example, using values from a quarterly balance sheet, the value for Inventory at the end of the second quarter in 2014 would be calculated as the average of inventory at the end of the second quarter (Q2) and the end of the first quarter (Q1). (This particular spreadsheet does not use automatically average your balance sheet amounts, however). To keep an eye on the overall health of your company, you would want to keep track of your ROI and the metrics that compose it over time. Usually, that would be at least on a quarterly basis, and in some cases on a monthly basis. Once you spot negative movement in your ROI, drill down in the underlying metrics to see what has changed. Normally it is multiple metrics that have changed, so actual analysis is not quite as easy as it looks. From there you can take action focusing on that part of your company. He checks his ROI in 2013 to make sure it isn’t a seasonal issue and in this case, it isn’t. A similar drop in ROI did not happen last year in the third quarter of the year. Next, he looks in Level 2 of the ROI calculation to see what is different from the previous quarter. He notices that his Return on Sales has decreased 15% from the prior quarter. From there, he looks into the corresponding metrics in Level 3 (1st column in the green border). He then notices that sales are steadily up but gross margin has decreased and so has his operating income. Now he knows where to look and which department head he needs to talk with. Talk with your CPA if you need help getting the information to calculate your ROI and get into the habit of checking it at least on a quarterly basis. Is this the only financial metric you should be looking at? No. But if you are not looking at any on a consistent basis, this is a good start. Start with ROI and then build up a dashboard with other metrics appropriate to your company, industry, and value proposition that will help you drive your company to consistent success.